Session Buddy’s console provides access to advanced features and diagnostic information. In the event of a malfunction, the console may display error details that can aid Session Buddy’s support team in identifying the source of a problem. Session Buddy has two types of consoles available: one that’s specific to a Session Buddy tab, and one that applies to the application in general. To access a Session Buddy tab’s console, first make sure the Session Buddy tab is currently the active tab. 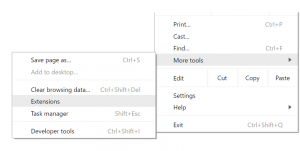 Then open Chrome’s menu and select More tools, then Developer tools. 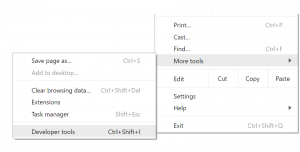 This will open the tab’s developer tools in either a new window or a pane. In the newly-opened developer tools, click on the Console tab to view any recent Session Buddy activity or error messages. Some entries display an arrow to their left that can be clicked to reveal additional details. When submitting information from the console to Session Buddy’s support team, the best approach is to expand all available console entries and attach a screenshot of these entries in an email to support. Alternatively, though less effective, the console’s text may be selected and copied into an email. To access Session Buddy’s general application-wide console, first open Chrome’s Extensions page by opening Chrome’s menu and selecting More tools, then Extensions. At the top of the Extensions page, ensure that the Developer mode checkbox is checked. 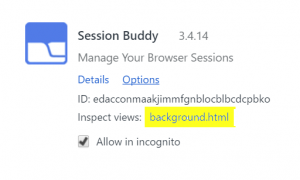 Scroll down to the Session Buddy line item and click on the background.html link. This will open a new window that contains Session Buddy’s application-wide console. The console may display logs of Session Buddy activity or error messages (usually in red) if Session Buddy has recently encountered an error.